Technology Spotlight: And The Winner Is…..
SeniorNavigator is the WINNER of ConnectVA’s Innovation in Community Impact Award offered in collaboration with RichTech, awarded on May 13th at their 20th annual RichTech Gala. 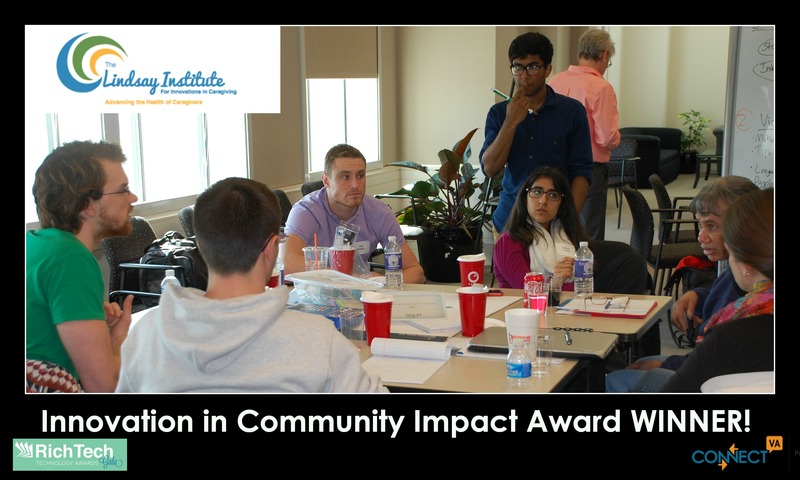 Learn how their Lindsay Institute for Innovations in Caregiving partnered with local college students to devise innovative technology solutions to advance caregiver health and wellness! Tell us about the Lindsay Institute for Innovations in Caregiving. The Lindsay Institute for Innovations in Caregiving is an initiative of SeniorNavigator, a statewide public/private partnership non-profit that helps Virginia’s seniors, caregivers and families find vital information and community programs so they can live with independence, dignity and hope. The goal of the Lindsay Institute is to improve the health of caregivers—with the number of Virginians over 65 doubling by the year 2030 to 1.8 million and there already being over 1 million caregivers across the state providing 88% of all eldercare—the Institute and it’s esteemed Advisory Council are working together to keep caregivers from neglecting their own health while they care for a loved one. For more information, please visit CaregivingInnovations.org. What was the need you recognized in the community? These family caregivers are “often thrown into the situation without warning,” said Adrienne M. Johnson, executive director of SeniorNavigator. “While caring for a loved one can be gratifying, they are likely to be juggling caregiving along with jobs, children, and a host of other responsibilities,” Johnson said. The result of this juggling act is pervasive stress and a resulting downward spiral of health problems for many caregivers. How has The Lindsay Institute for Innovations in Caregiving implementing innovative uses of technology to address this need? A diverse group of multidisciplinary college students from seven Virginia-based higher-education institutions across gathered over a weekend in March to address the often overlooked issue of caregiver health and wellness at the inaugural 2015 “Caring for the Caregiver Intercollegiate Hack”. Hacks or hackathons are usually software or technology focused development events focused on intense problem solving over a short period of time. The style of event, though exhausting, is an exciting venue for creative thinking. Students formed multi-disciplinary teams of 5-6 participants per school that were under the leadership of a faculty coach. Additionally, each team was paired with a family caregiver – helping students better understand the challenges and struggles caregivers face. Teams from George Mason University, James Madison University, Lynchburg College, The College of William and Mary, University of Virginia, Virginia Commonwealth University, and Virginia Tech participated in the Hack working over a 25 ½ -hour period to create realistic and usable apps or products designed to positively impact caregiver health. An esteemed panel of judges selected the grand prize winner based on the technology’s originality, usability, feasibility, and how developed it was at the time of the presentation. What was the result of this innovative event? The team representing Virginia Tech was awarded the $5,000 Grand Prize, for CareFood, an online platform that connects caregivers to share a virtual dinner table and community – sharing recipes while offering customized shopping lists and meal plans based on nutritional needs and dietary restrictions of themselves and the care recipient. The $1,000 People’s Choice Award, chosen by audience members, was awarded to the team from George Mason University for Family Room, an online portal that allows caregivers to combat isolation via connections with family near and far, while capturing the care recipient’s shared life story. With the teams retaining ownership of their ideas, Johnson says “we are providing teams with tools to enable them to pursue the development of the ideas that came out of the weekend.” SeniorNavigator and its Lindsay Institute will offer both winning teams access to assistance with the development of a business plan and funding opportunities through Victor MacLaughlin with CrowdV3 Holdings in Richmond, VA and through other connections made at the Hack event. Thank you to all of those who submitted nominations and to our finalists – we are very proud of you all for implementing innovative change through technology in our Community!